The NHRDA kicks off the 2016 Championship Season at the 8th annual Texas Diesel Nationals. The NHRDA makes its return to Phoenix Arizona for the Desert Diesel Nationals, presented by Strictly Diesel. Mark your calendars as the NHRDA returns to the Tulsa Raceway Park for the 2nd annual Oklahoma Diesel Nationals. The action kicks off at Jefferson County Fairgrounds on Friday with truck and tractor pulls. Then Saturday the action is at Bandimere Speedway. The NHRDA returns to Gateway Motorsports Park for the 3rd annual Midwest Truckin Nationals. The NHRDA returns to Woodburn Dragstrip for the Pacific Coast Diesel Nationals, presented by ISSPRO. The NHRDA returns to Castrol Raceway for the JB’s Canadian Diesel Shootout. The NHRDA returns to Yellowstone Dragstrip for the Big Sky Truck Fest, presented by G&J Diesel. 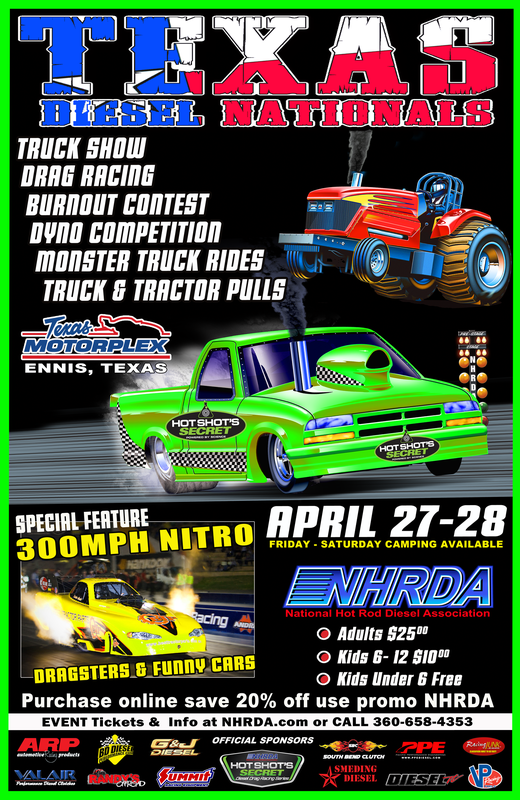 Come see who will be crowned the NHRDA World Champion at the Texas Motorplex in Ennis Texas. The Pacific Coast Diesel Nationals presented by ISSPRO turned out to be a great event as the NHRDA made their return to the west coast. The weather was perfect and the competitors were ready for action. In the MBRP Diesel Drag Racing series racers came from all over the Northwest as they converged on Woodburn Dragstrip to battle it out for the trophies. Jarid Volmer took home top honors in both Pro Street and Pro Stock. Rob Coddens took home the trophy in Super Street and the points lead. Local racer John Floyd Jr. took home the Sportsman diesel win. Once again the NHRDA will team up with the Lucas Oil Pro Pulling League to put on the sled pull at the NHRDA Indiana Diesel Shootout. But for the first time ever this sled pull will not only be a points pull for Lucas Oil Pro Pulling League it will also be a point’s pull for the NHRDA Diesel Sled Pulling Series. Pullers must be a current NHRDA member to be eligible for NHRDA Diesel Sled Pulling National Points and contingency money from the NHRDA contingency sponsors, the membership fee is $50.00 for the year. Competitors in Super Stock, 3.0 and 2.6 must earn points at a NHRDA Diesel Sled Pulling Series event to earn an invitation to the NHRDA World Finals on September 28th at the Texas Motorplex in Ennis, Texas. The NHRDA will have a booth right next to the PPL’s booth at the front gate to give all the pullers an easy way to sign up for their NHRDA membership and NHRDA contingency program. Remember that the NHRDA World Finals is an invitation only and pullers wanting an invite must have pulled at a NHRDA Diesel Sled Pulling Series event during the 2013 season.